Surrounded by orchards, steep mountains and the blue fjord, this holiday apartment shares the ground floor of a house with another holiday apartment, and where the 1st floor is permanently rented out. Each apartment has its own terrace and yard. Comfortable leather couches in the living room. Cable TV with 20 channels and Astra1 with hundreds of German, English and other channels. 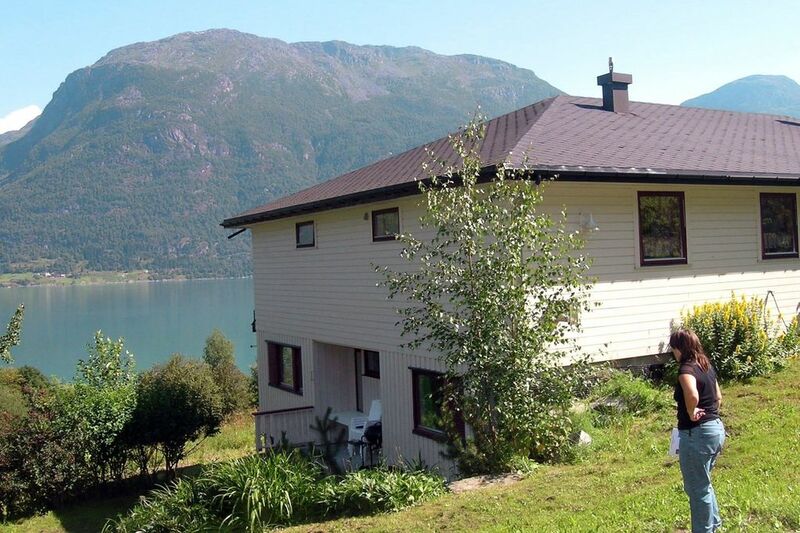 From the house you have a magnificent view of Sognefjorden and the grand waterfall on the other side of the fjord. Especially in early summer when the snow melts in the mountains, the waterfall is impressive to watch. In may, all fruit trees in the district are in full bloom while the mountain tops are still covered in snow. It is a wonderful sight that needs to be experienced! In autumn you can buy fruit from the local fruit farms. Just below the house is a beach with small pebbles, where both children and adults can go swimming. Approx. 6 km away to a river with fish. The extra sleeping arrangement in the living room for 2 people consists of a sofabed with an extraction for the second person. Travel across the fjord and experience Norway's smallest stave church, Urnes Stavkyrkje. If you want to fish in the fjord, you can rent the 14 ft rowing boat for only 150 NOK per day or a 15 ft boat with 5 hp motor at 250 NOK per day. The distance to the boats is 100 meters.